Meet Nik Wallenda High-Wire Artist at Falls Avenue following his historic wire-walk across the Horseshoe Falls. The “highly”-anticipated tightrope walk would not be complete without a Meet & Greet with the celebrity performer himself! Nik Wallenda will be making an appearance in the Falls Avenue Resort/Casino Niagara Atrium, part of Falls Avenue Resort at 11am on Saturday June 16th, 2012. Don’t miss the once in a life-time high-wire act at 10pm June 15, 2012. Free viewing of the event from Queen Victoria Park at the brink of the Niagara Gorge just a few minutes walk from Falls Avenue Resort. The event will be followed by the always spectacular Falls fireworks display. Stay the night and come out the next day to take photos, get autographs, ask questions or just say hello. The Falls Avenue Resort Atrium is located on the UL Level of Falls Avenue Resort (one floor above Falls Avenue Street Level). 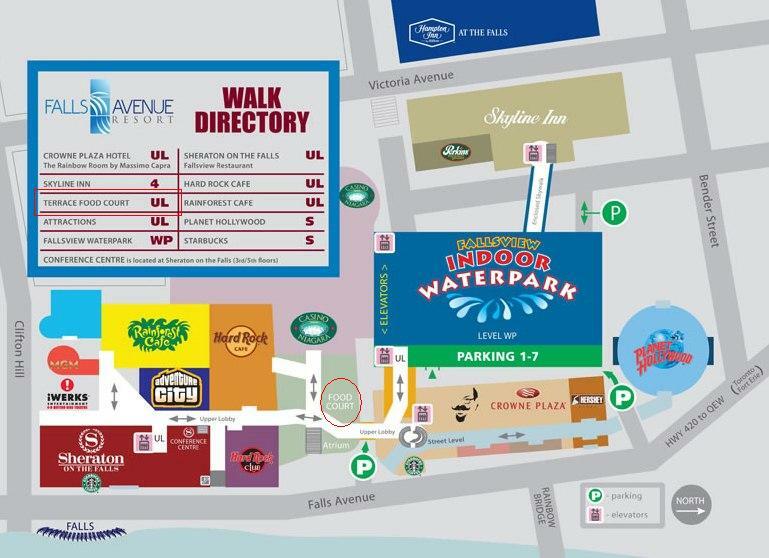 Located between the Crowne Plaza Hotel and Hard Rock Cafe beside The Terrace Food Court.